Junior sizing runs about 2 sizes smaller than a regular adult unisex size. For example a 12-14 (Junior large) is close in size to an adult small. 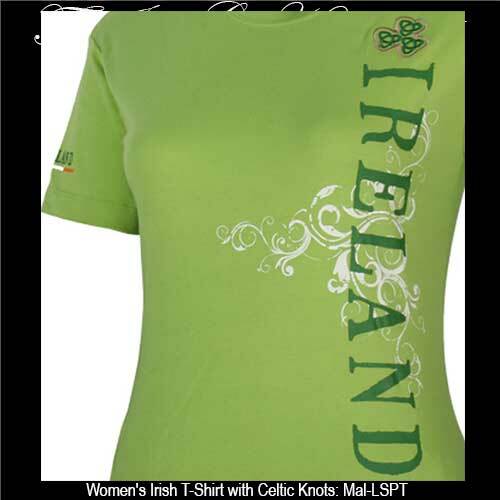 This women's Irish t-shirt features ultra soft, 100% cotton, light green material. The contoured fit is consistent with junior or European sizing and the design on this pre-shrunk Irish t-shirt for women features a vertical side print design that is enhanced with the word Ireland along with Trinity knots on the left chest. The junior sized Irish shirt is received with a Celtic knot history card, complements of The Irish Gift House.